When it comes to turnovers, the French have a version called chausson aux pommes, consisting of crisp, flaky pastry layers surrounding a smear of apple compote. There’s a nursery-food quality about this particular treat, which might have something to do with standing at the counter of a patisserie and ordering an apple slipper. McDonald’s used to serve a type of turnover, better known as fried apple pie. The crust possessed a fascinating texture: crunchy, bubbly craters that looked like a lunar surface. Apparently a lot of people became peeved when McDonald’s switched from fried to baked pies, circa 1992. If you’re among them, here’s a comprehensive listing of fried pie sightings. 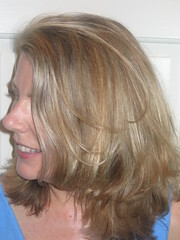 A college boyfriend once took me to visit his grandmother in Palm Beach. Tou-Tou lived in a swishy place on the water, had hair the color of a kumquat, and seemed completely surprised to see us. The night we arrived she was hosting a benefit for a Republican senator; the high-ceilinged rooms were filled with tanned people that resembled George Hamilton. We didn’t spend much time with Tou-Tou until the evening before we were to leave, when the three of us ate dinner in the big dining room that smelled of cash. At the end of the meal, a maid served us dessert from a silver tray and guess what was on it? Pepperidge Farm turnovers! Tou-Tou gave me first choice on the filling, and I (daintily) grabbed the only apple. At that point I decided I liked Tou-Tou a lot, even if she was a Republican. 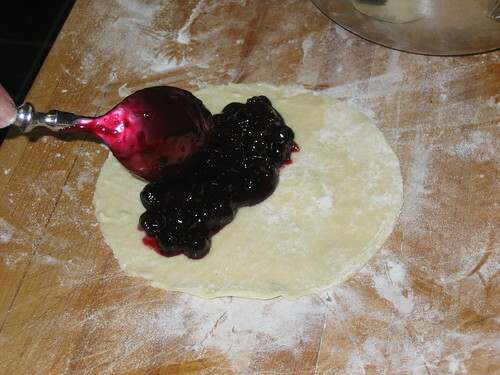 This recipe, however, is for blueberry turnovers. I’ve already given you lots of apple treats: apple pie, apple crumb pie, and apple dumplings. Besides, blueberries don’t require peeling and slicing. Tick, tock goes the relentless pie-making clock. You could substitute apples for the blueberries, although you’d need to cook them first, I think. I used a cream cheese pastry and the resulting turnovers were lovely and crisp with a nice juicy filling. Whisk together sugar and salt. Add blueberries and toss gently to coat the fruit. Allow to sit for at least 30 minutes. Transfer blueberries and their juices to a saucepan. Stir in the cornstarch until it is dissolved and bring the mixture to a boil, stirring gently. Allow to boil for 30 seconds to a minute, until the juices become clear and very thick. Gently stir in the almond extract. Empty the fruit mixture into a bowl and allow it to cool completely. Make a 6-inch circle cardboard template. 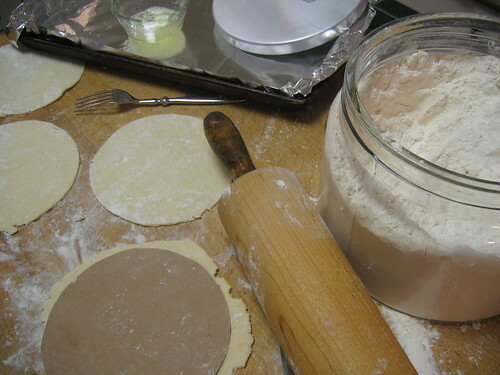 (I used the back of a legal pad,) Divide the pastry dough into 10 equal pieces. Using a well floured board and rolling pin, roll the dough into a circle. Place the template on top and with a sharp knife, cut out the dough into the circle. Brush the bottom half of the circle with egg white, leaving a 1-inch border. Spoon 2 tablespoons filling onto this section and then fold the top part of the dough over the fruit, so that the edges line up. With your fingers, press the border to seal it. Fold the edge up over itself, pressing again to seal. Place carefully on a foil lined baking sheet. Repeat with remaining turnovers. Refrigerate for 1 hour. Preheat oven to 400. Set an oven rack on the lowest position and place a large cookie sheet, baking pan, or baking stone on top. Brush milk lightly on top of turnovers and sprinkle with a bit of sugar. 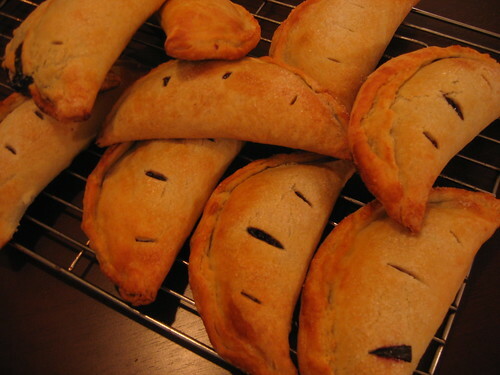 Use a sharp knife to cut a few steam vents into the top of each turnover. Bake 20-30 minutes or until the filling is bubbling out of the vents and the pastry is golden. Cool on a wire rack. Wow -these look so great! I must admit, I was quite disappointed when McDs tried to go healthier with baking their pies...But, since I haven't eaten fast food in ions, I have come to peace with it..ha! ha! Nonetheless, I love what you've done here...and like the idea of blueberry turnovers. Chris, I wonder how much "healthier" the McD's baked pies are, anyway. Think they're listed on the USDA food pyramid? Caty, They are (were)really good!